If home care remedies don't work to clear up your acne, see your primary care doctor. He or she can prescribe stronger medications. 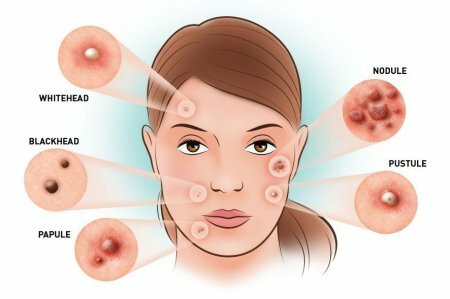 If acne persists or is severe, you may want to seek medical treatment from a doctor who specializes in the skin (dermatologist). The Food and Drug Administration warns that some popular nonprescription acne lotions, cleansers and other skin products can cause a serious reaction. This type of reaction is quite rare, so don't confuse it with the redness, irritation or itchiness where you've applied medications or products. The plugged pore may cause the follicle wall to bulge and produce a whitehead. Or the plug may be open to the surface and may darken, causing a blackhead. A blackhead may look like dirt stuck in pores. But actually the pore is congested with bacteria and oil, which turns brown when it's exposed to the air. 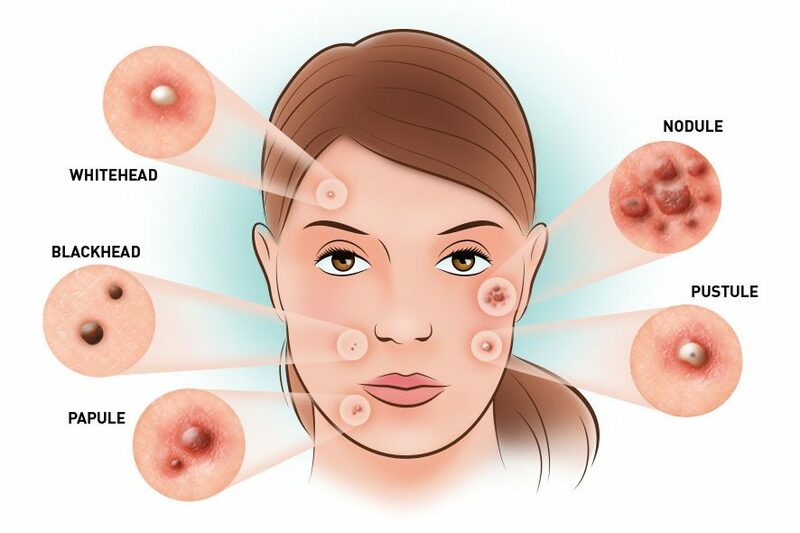 Pimples are raised red spots with a white center that develop when blocked hair follicles become inflamed or infected. Blockages and inflammation that develop deep inside hair follicles produce cyst-like lumps beneath the surface of your skin. Other pores in your skin, which are the openings of the sweat glands, aren't usually involved in acne. - Hormones. Androgens are hormones that increase in boys and girls during puberty and cause the sebaceous glands to enlarge and make more sebum. Hormonal changes related to pregnancy and the use of oral contraceptives also can affect sebum production. And low amounts of androgens circulate in the blood of women and can worsen acne. - Certain medications. Drugs containing corticosteroids, androgens or lithium can worsen acne. - Diet. Studies indicate that certain dietary factors, including dairy products and carbohydrate-rich foods — such as bread, bagels and chips — may trigger acne. Chocolate has long been suspected of making acne worse. A recent study of 14 men with acne showed that eating chocolate was related to an increase in acne. Further study is needed to examine why this happens or whether acne patients need to follow specific dietary restrictions. - Stress. Stress can make acne worse. - Greasy foods. Eating greasy food has little to no effect on acne. Though working in a greasy area, such as a kitchen with fry vats, does because the oil can stick to the skin and block the hair follicles. This further irritates the skin or promotes acne. - Dirty skin. Acne isn't caused by dirt. In fact, scrubbing the skin too hard or cleansing with harsh soaps or chemicals irritates the skin and can make acne worse. Though it does help to gently remove oil, dead skin and other substances. - Cosmetics. Cosmetics don't necessarily worsen acne, especially if you use oil-free makeup that doesn't clog pores (noncomedogenics) and remove makeup regularly. Nonoily cosmetics don't interfere with the effectiveness of acne drugs. - Hormonal changes. Such changes are common in teenagers, women and girls, and people using certain medications, including those containing corticosteroids, androgens or lithium. - Family history. Genetics plays a role in acne. If both parents had acne, you're likely to develop it, too. - Greasy or oily substances. You may develop acne where your skin comes into contact with oily lotions and creams or with grease in a work area, such as a kitchen with fry vats. - Friction or pressure on your skin. This can be caused by items such as telephones, cellphones, helmets, tight collars and backpacks. - Stress. This doesn't cause acne, but if you have acne already, stress may make it worse. - List your key medical information, such as other conditions with which you've been diagnosed and any prescription or over-the-counter products you're using, including vitamins and supplements. - List key personal information, including any major stresses or recent life changes. - List questions to ask your doctor. Creating your list of questions in advance can help you make the most of your time with your doctor. - What treatment approach do you recommend for me? - If the first treatment doesn't work, what will you recommend next? - What are the possible side effects of the medications you're prescribing? - How long can I safely use the medications you're prescribing? - How soon after beginning treatment should my symptoms start to improve? - When will you see me again to evaluate whether my treatment is working? - Is it safe to stop my medications if they don't seem to be working? - What self-care steps might improve my symptoms? - Do you recommend any changes to my diet? - Do you recommend any changes to the over-the-counter products I'm using on my skin, including soaps, lotions, sunscreens and cosmetics? - When did you first develop this problem? - Does anything in particular seem to trigger an acne flare, such as stress or — in girls and women — your menstrual cycle? - What medications are you taking, including over-the-counter and prescription drugs as well as vitamins and supplements? - In girls and women: Do you use oral contraceptives? - In girls and women: Do you have regular menstrual periods? - In girls and women: Are you pregnant, or do you plan to become pregnant soon? - What types of soaps, lotions, sunscreens, hair products or cosmetics do you use? - How is acne affecting your self-esteem and your confidence in social situations? - Do you have a family history of acne? - What treatments and self-care steps have you tried so far? Have any been effective? - Retinoids. These come as creams, gels and lotions. Retinoid drugs are derived from vitamin A and include tretinoin (Avita, Retin-A, others), adapalene (Differin) and tazarotene (Tazorac, Avage). You apply this medication in the evening, beginning with three times a week, then daily as your skin becomes used to it. It works by preventing plugging of the hair follicles. - Antibiotics. These work by killing excess skin bacteria and reducing redness. For the first few months of treatment, you may use both a retinoid and an antibiotic, with the antibiotic applied in the morning and the retinoid in the evening. The antibiotics are often combined with benzoyl peroxide to reduce the likelihood of developing antibiotic resistance. Examples include clindamycin with benzoyl peroxide (Benzaclin, Duac, Acanya) and erythromycin with benzoyl peroxide (Benzamycin). - Dapsone (Aczone). This gel is most effective when combined with a topical retinoid. Skin side effects include redness and dryness. - Antibiotics. For moderate to severe acne, you may need oral antibiotics to reduce bacteria and fight inflammation. Choices for treating acne include tetracyclines, such as minocycline and doxycycline. Your doctor likely will recommend tapering off these medications as soon as your symptoms begin to improve or as soon as it becomes clear the drugs aren't helping — usually, within three to four months. Tapering helps prevent antibiotic resistance by minimizing undue exposure to these medications over a long time. Antibiotics may cause side effects, such as an upset stomach and dizziness. These drugs also increase your skin's sun sensitivity. They can cause discoloration of developing permanent teeth and reduced bone growth in children born to women who took tetracyclines while pregnant. - Combined oral contraceptives. Combined oral contraceptives are useful in treating acne in women and adolescent girls. The Food and Drug Administration approved three products that combine estrogen and progestin (Ortho Tri-Cyclen, Estrostep and Yaz). Anti-androgen agent. The drug spironolactone (Aldactone) may be considered for women and adolescent girls if oral antibiotics aren't helping. It works by blocking the effect of androgen hormones on the sebaceous glands. Possible side effects include breast tenderness, painful periods and the retention of potassium. - Isotretinoin. This medicine is reserved for people with the most severe acne. Isotretinoin (Amnesteem, Claravis, Sotret) is a powerful drug for people whose acne doesn't respond to other treatments.